Stitches and Scissors: My Luck has Changed. Well apparently it was I who was lost and not my quilt. Who knew that getting a Thank You card out of my Hope Chest would change my life?!?!?! I will start at the beginning for those that are just joining in. My family moved right after Christmas. 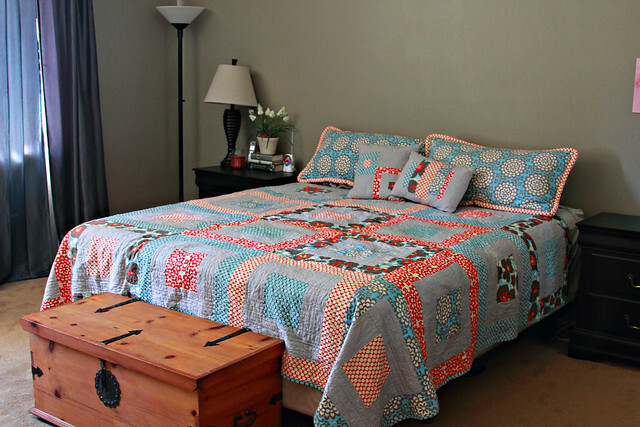 I had just finished a quilt for my bed and had it returned from the long arm quilter and only had it on my bed for 2 months when we moved. In the move the quilt was LOST. My family searched EVERYWHERE. After looking everywhere we gave up becasue what else can you do. I wrote this R.I.P. post and started thinking of a new quilt. Well 1 day shy of 4 months of losing the quilt I FOUND IT!!!!! My mom and husband each needed a Thank You card last night and at the foot of my bed I keep my Hope Chest that I keep odds and ends in and I went to get one out of there and once I opened it I just starred! Apparently I was making weird noises since my husband comes in and was like what is going on. I couldn't talk and just pointed to the bag that was on top of everything in my Hope Chest. Brett was like, oh is that your quilt????? Hmmmm YES YES IT WAS! I pulled the bag out and ripped it open ran into my parents room and my mom and I just wanted to cry (but we didn't) we just could not believe that I had found it. These 4 months that it had been missing it had been at the foot of the bed the whole time inside my Hope Chest. So close to the bed that it was meant to be on. Hilarious I know. Apparently I was the one that could not remember where it was. Moving does really mess you up! I am just so happy that I have it and my bed isn't ugly anymore!!!! So glad you found it! That would make me ripe bananas to not be able to find it..
And it is sooo purty! Awesome news! I was so sad when you lost it. It's so beautiful, and you look so happy in your pictures. Woo hoo! So glad that you found it! :) You are so adorable! And now your bed looks so pretty again! Your face in the bottom photo is priceless, pure joy! 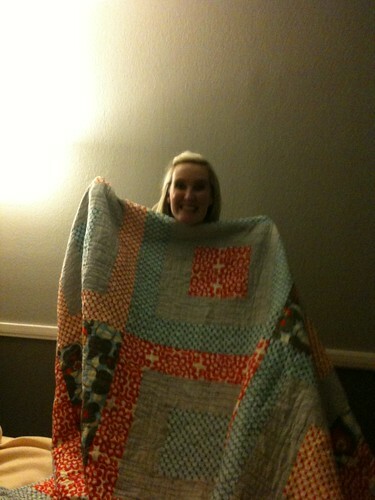 Yay for finding your quilt! It's beautiful! Too Funny! I am with Erin! Keep working on the summery Quilt! Woohoo! So glad you found it! Oh I know you were so sad about that! Super happy that you found it!! BTW, Derek hates that I dress the kids up in Sox gear! Darci, I'm so glad it showed up--I knew it had to! Thank goodness! All that time and work and beautiful fabric, back where it belongs! What a great ending! And that first picture of you on the bed - you and the bed look gorgeous! :) That's the best! I'm so glad you found it! Oh my goodness, I can't believe it was right there the whole time!!!! Like looking for your glasses and they are right on your face! YAY for you Darcie, and YAY to a pretty quilt on display again!! Awesome!!!! SO happy for you!!! You better never let it out of your sight again!! Oh I can only imagine how you felt when you found it. I hate loosing things let alone a beautiful quilt like that. It looks gorgeous on your bed and you look so happy. Darci, how wonderful for you!! I would have squealed and cried at the same time, oh and run around in circles then just stroke it for a while. Yeah...that would be a lot of hard work, time and money lost if you didn't find it. It is a lovely quilt, too! HOLY MOLY!! That is awesome you FOUND it! I can't believe it. I am sooo sooo pleased for you! already told you on Flickr, but this is just awesome! And I'm with Erin. Finish the other quilt and then you can have one to swap out with the seasons. I think I'm going to go 'lose' my bird quilt for a couple of months. 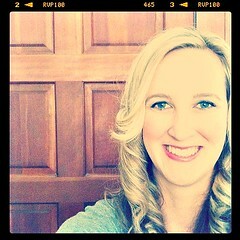 Maybe I'll like it better if I haven't looked at it for a while. Yay for the find! I love it! Woo Hoo thanks for the share on the fabric line new at joanne's. I'll have to check it out because they are such fun colors. have a happy sewing day! I'm so pleased you found it. I wonder if the fabric fairy has just delivered it in time for Easter?! Maybe you should leave a present for her in case she turns up looking for something else to 'borrow' ;o) Enjoy sleeping under your marvellous quilt. Wow, what wonderful news! I bet you slept well under your quilt that night! Enjoy. It is beautiful. I am glad you found it. That sounds like something I would do. I hope you enjoy your quilt. Woohoo! I'm glad it turned up! I'm so happy for you that your quilt was home the whole time!! It looks great on your bed, and you look thrilled! I knew you'd find it! I really, really did and I'm so glad you did!!! Oh my god Darci! That's amazing! Someone was looking out for you for sure! I am so glad you found it. What a relief! It truly is a work of art! so glad you found it but how weird hey?This sort of thing happens to me too, so I know the joy it brings.